There are many adventurous types who would rather ditch the comforts of a hotel and instead ‘rough it’ out here in Ely, Minnesota. If your ideal vacation involves swapping a memory foam mattress for a tent, a futon for a log, and meals cooked in a kitchen for ones over an open fire – then Canoeing and Fishing in the BWCA is your dream come true. Moose Track Adventures are full BWCA outfitters in Ely. We also offer partial outfitting, shuttles, fly-in trips, and obtaining BWCA Permits for anyone who is looking for a real wilderness adventure in the Boundary Waters Canoe Area (BWCA). Ely is one of the major hubs of the Boundary Waters. And as a result, Canoe Trip Outfitters in Ely are numerous. However, Moose Track Adventures can confidently say that our BWCA Outfitters operate on an entirely different level. These are the stomping grounds of Jim, one of the owners and operators of Moose Track Adventures. His 10 plus years of experience as a guide, combined with his own canoeing passion and Boundary Water Canoe Area (BWCA) and Quetico Provincial Park exploring, allows Moose Track Adventures to operate on a level above the rest. We have been BWCA Outfittersjust outside Ely Minnesota for over 20 years. We believe that choosing a Boundary Waters outfitter for your BWCA trip shouldn’t be a hassle – you’ve found one who takes the time to customize your Boundary Waters canoe trip so that your interests and abilities are matched and fulfilled. Years of guiding the pristine Boundary Waters Canoe Area has taught us the ‘ins’ and ‘outs’ of canoe tripping and we pass this knowledge along to you in all of the packages we offer. Additionally, all our packages come with the BEST service, the BEST gear, and all at the BEST price. Whether you are a family looking for a relaxing canoe trip to create memories with the kids, a voyageur searching for adventure or an enthusiastic fisher seeking a trophy fish, we will accommodate your needs. Our focus, as an Ely BWCA Outfitter Company, is not only to provide all the equipment, food and camping gear needed for your stay in the Boundary Waters, but also to take careful consideration of the condition and quality of the gear that you will depend on to get through your adventure. With a Boundary Waters passion ourselves, we understand how much the gear and equipment you take with has an impact on your wilderness experience. That is why we only supply our campers with brand name, high-quality top performance gear to ensure you have the reliability you need when when venturing out into nature. We choose our equipment and gear based on performance, ease of use, durability and comfort. We are known for our quality outfitting gear and switch all of our equipment out every three years – at least – or when we feel it is no longer in acceptable condition. Moose Track Adventures is cooperator #98. This means that all you have to do is call us, reserve your dates and we will get your needed permits. There is no need to stop anywhere else to get your Boundary Water Permits as we can obtain BWCA permits for you and print them out right at our lodge. This takes any hassle out of the process, allowing you to instead focus on the adventure ahead. However, if you would rather feel free to complete the process yourself, just remember permits are limited and are first come, first serve. Moose Track Adventures has the skill, associations, experience and equipment needed to fully outfit your Northern Minnesota Canoe and Camping Trip. We help you in mapping your route and equipping your entire group with high quality, brand name equipment, such as Kevlar canoes, Marmot tents, and Mountain Hardware. We also provide a shuttle to and from the Boundary Waters Permit Entry Points if desired. Before and after your canoe trip freshen up with a hot shower in our remarkably clean shower house, stay close to your departure and return point by staying at our campsite, or you have the choice to rent one of our lakeside cabins for a change of pace. Be confident in your journey from beginning to end by entrusting Moose Track Adventures to Outfit your group with a BWCA map, as well as determining a route, fully equipping you with Wenonah Kevlar Canoes, Rugged Canoe Paddles, MTI Livery Vests, Marmot Tents, Marmot Sleeping Bags, Kondos Outfitter Packs, Deluxe Taped Rip-Stop Tarps, Coleman Stoves, Crazy Creek Camp Chairs and hardy meals that can keep up with your body’s calorie demands. When you choose Moose Track Adventures as your Full Ely Outfitter, the outfitting menu to choose from is phenomenal. We have choices ranging from sirloin steak to s’mores fixings, minestrone to breading for your daily catches and even vegetarian options. Put your trust in us to fuel you on your wilderness adventure in the BWCA, a vacation where you truly forge your own path. When all you have is a paddle in hand, the gear you can carry on your back, water under your canoe and the BWCAW surrounding you, it is imperative that you choose capable Northern Minnesota Outfitters. And we can assure you that Moose Track Adventures Outfitters is your premier selection for Boundary Waters Outfitting. We have the BEST service, the BEST gear at the BEST price! All-Inclusive Deluxe Kevlar Canoe Package – This complete Boundary Waters Outfitting package is our specialty. All you need to do is reserve your spot, bring your personal items and fishing gear to our location, and we take care of the rest: permit, canoe, paddle, tent, camping equipment, packs, stove and all of your meals. With our level of outfitting and boundary water guiding and excursion experience, there is no doubt you will be totally prepared with everything needed for your journey. We revel in passing along our in-depth knowledge to individuals who rely on our Full Outfitting Package. Kevlar Canoe/Food Package – If you’re an avid canoer there is a good chance you have all your gear, are comfortable with it and need just a canoe and food. We can provide you with a robust meal plan and a lightweight but durable canoe in terrific condition. 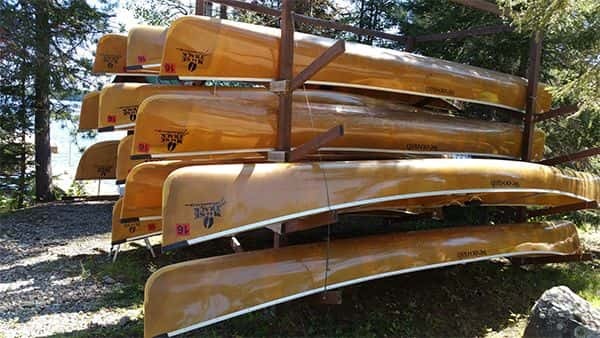 Partial Canoe Outfitting – We can also help BWCA adventurers if they have a few missing items, such as a canoe, tent, food and other small necessities. Individual rates can be found on our Partial Canoe Outfitting page. BWCA Fly-In Trips – Moose Track Adventures can arrange a superior Boundary Waters trip by flying you out into the backwoods and outfitting your whole adventure. The float planes available through us give you an aerial view and multiple destination choices. From the necessary permits, to mapping your route, meals, equipment, camping gear and the end of trip pick up – Moose Track Adventures is the premium choice. BWCA Shuttle & Transportation – Get a stress free ride up to whichever Boundary Water entry point you want to go through. Moose Track Adventures offers transportation and shuttles for the whole BWCA area and every entry point available. Rates depend on the amount of outfitting you have selected from us, the amount of gear you will be taking with you and which entry point you request. The Boundary Waters is a popular destination for adventure travelers who are pursuing backcountry camping, canoeing and fishing. Want to get away from the hustle and bustle of the city? Searching for relaxation & beautiful scenery? People of all ages & canoe and camping abilities can appreciate the nature and wildlife that this area has to offer. The Boundary Waters is the ideal vacation spot for your family and you! The Boundary Waters (BWCA) is an area of wilderness covering the Canada-United States border between Ontario and Minnesota. 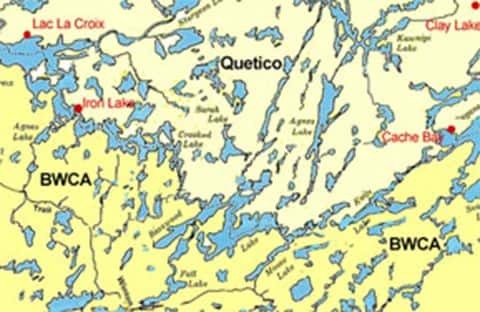 This region is a part of the Superior National Forest in northeastern Minnesota, and in Canada the Quetico Provincial Park is in Ontario. The Boundary Waters wilderness is characterized by a massive network of lakes, waterways & bogs within a glacially-carved landscape of bedrock and boreal forest. Not ready for an overnight Boundary Waters trip and just want to dip your feet in the wild waters for a day? As a BWCA outfitter, we can plan a short day or 1/2 day trip right from our resort where you can experience remarkable scenery, ancient pictographs, viewing wildlife or catching fish in a remote river or lake. From a day to week long trips, there is no one better for you to choose as your Ely BWCA Outfitters than Moose Track Adventures. Contact us by our preferred method by calling 218-365-4106.